Senate Judiciary Chairman Chuck Grassley doesn’t plan to release the committee’s transcript from a closed-door interview with Fusion GPS co-founder Glenn Simpson in its Russia probe — at least for now. The partisan fight over the so-called Trump dossier is intensifying on Capitol Hill. 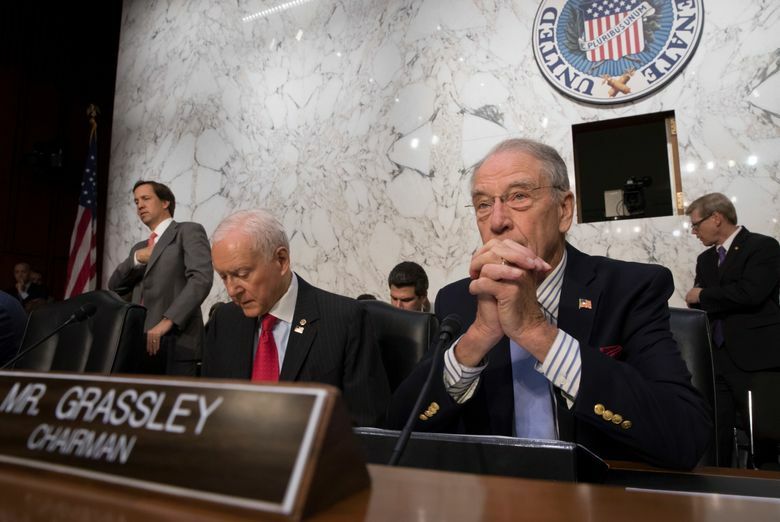 Senate Judiciary Chairman Chuck Grassley doesn’t plan to release the committee’s transcript from a closed-door interview with Fusion GPS co-founder Glenn Simpson in its Russia probe — at least for now — despite a request from two Democrats, according to a spokesman for the Iowa Republican. Sens. Sheldon Whitehouse and Richard Blumenthal both called on Grassley to release the transcript Monday, complaining about leaks and a referral by Grassley of dossier author Christopher Steele to the Justice Department for possible criminal prosecution. Republicans suggest the FBI may have relied improperly on the unverified dossier by Steele, a former British spy, that was commissioned by Fusion GPS and paid for largely by the campaign of Donald Trump’s 2016 rival Hillary Clinton and Democrats. “Sadly, attacks on Simpson and Christopher Steele, as well as selective leaks of parts of Simpson’s congressional testimony, have recently become a distraction from our work investigating the breathtaking proven and alleged crimes of the Russian government and the Trump team,” Blumenthal, of Connecticut, and Whitehouse, of Rhode Island, wrote. Simpson testified behind closed doors only after being subpoenaed to do so. Hartmann said Simpson would be welcome to return and testify at a public hearing. Democratic Rep. Eric Swalwell of California, one of a slew of Democrats to denounce the Republican senators for the criminal referral, criticized South Carolina Republican Sen. Lindsey Graham as “a man possessed” after he and Grassley recommended the criminal investigation. They sent a classified memorandum to Deputy Attorney General Rod Rosenstein and FBI Director Christopher Wray detailing the findings that led to their request. “I want a special counsel to look not only at how Mr. Steele conducted himself, what the FBI did with the dossier, whether (Department of Justice official Bruce Ohr), whose wife worked for Fusion GPS alongside Mr. Steele, what involvement did he have in the dossier?” Graham said on “Meet the Press” on Sunday. Ohr met with Simpson after the November 2016 election “to discuss our findings regarding Russia and the election,” Simpson said in a court document. FBI Director James Comey concluded the initial Clinton email investigation in July 2016, four months before the 2016 election. Ohr has had no role in the ongoing Trump-Russia investigation, Rosenstein told Congress in December. Still, Graham has his crosshairs fixed on Ohr for his role in the Clinton email investigation. “I want to find out if the lead investigator of the Clinton email investigation had a political bias against Trump for Clinton to the point where it was a sham investigation,” Graham said. Democrats on the Judiciary Committee were irate at their colleagues for issuing the criminal referral.